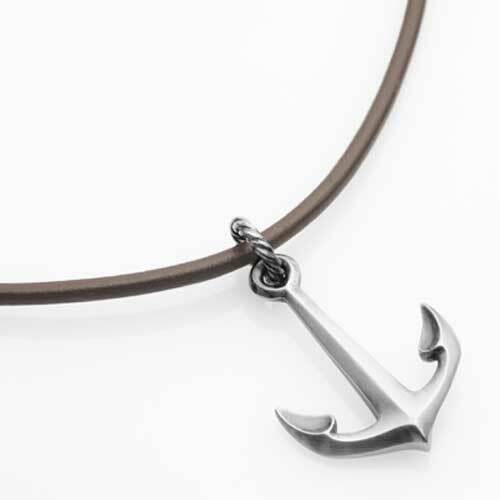 Ships Anchor Silver Necklace : LOVE2HAVE in the UK! This silver necklace is just one of some solid sterling silver pieces we sell inspired by nautical themes. The pendant, in this case, comes in the form of an intricately detailed anchor. The detail is just outstanding and more than conveys the highly skilled artistry that went into creating it. It has a fantastically stylish modern design to its form with curved shaping and ridges. The ridges catch the light as depicted in the image, therefore accentuating the smooth shaping giving the piece a real definition. The silver has a matte steel finish, and it comes threaded onto a brown leather necklace measuring 18 inches as standard. A rope-like eyelet joins the cord to the anchor which is yet more attention to realism on behalf of the designer. Other lengths are available, so please do email us.